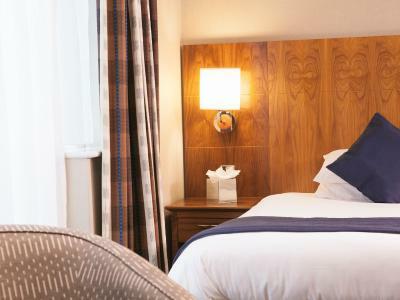 Lock in a great price for Harbour Heights Hotel – rated 8.5 by recent guests! The reception staff were excellent. The views from the lounge, restaurant and bar were terrific. Lounge Food we had in the evening was very good, efficient service and most enjoyable. Really enjoyed our stay. Hotel was quiet. Our room was big. 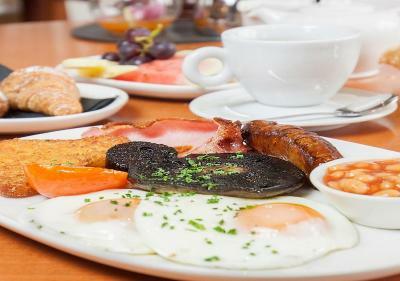 Breakfast was lovely and nice to have options of differnt coffees. 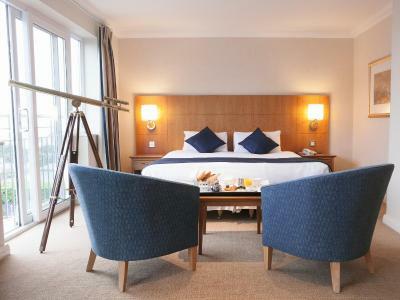 Excellent hotel, extremely clean, comfortable room, amazing views, fantastic location. Breakfast was lovely with a wonderful selection of food. We also stayed for Sunday lunch which was superb. The staff were very attentive and friendly. We had a view from our room over the Harbour which was the "icing on the cake!" 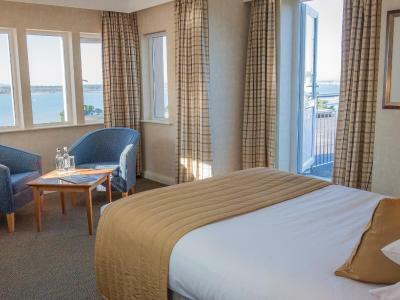 The view of Poole Harbour from the room was wonderful. We also had a reasonable sized balcony to sit on. The terrace on the ground floor is lovely to have a drink on in the evening. The staff were pleasant and friendly. 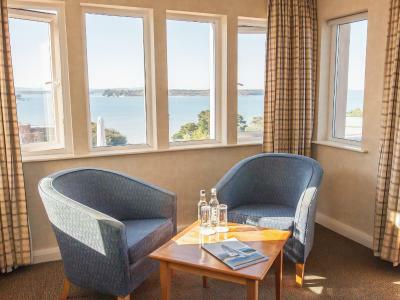 The room was well appointed with fabulous views over Brownsea Island, Poole Harbour and Sandbanks. The location was excellent and the staff helpful. The terrace was great in the good weather for a drink etc. Despite issues with the service at Breakfast the food was fine although slow in coming. 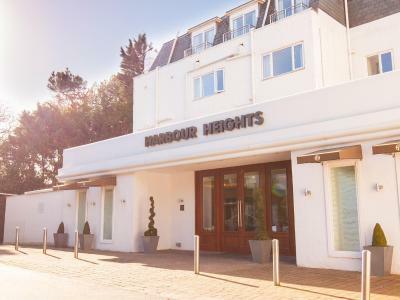 Harbour Heights Hotel This rating is a reflection of how the property compares to the industry standard when it comes to price, facilities and services available. It's based on a self-evaluation by the property. Use this rating to help choose your stay! 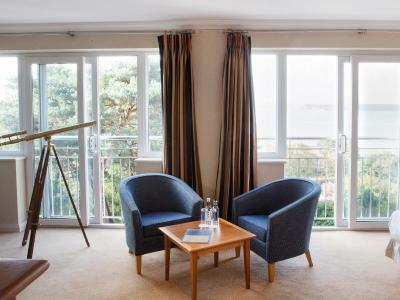 One of our top picks in Poole.With scenic views across Poole Harbor, this hotel offers boutique rooms, an award-winning restaurant and stylish cocktail bar. Poole Ferry Terminal is 15 minutes away by car. 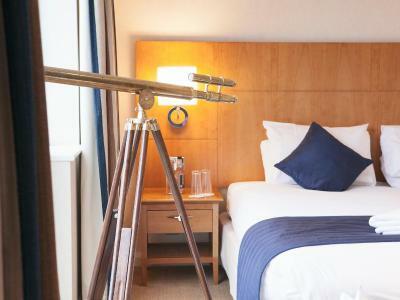 The rooms at FJB Collection - Harbor Heights have an elegant nautical theme, and each has a private bathroom with a spa bath and fluffy bathrobes (on request). 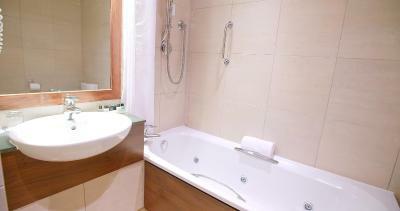 All rooms feature a satellite TV and tea and coffee facilities. 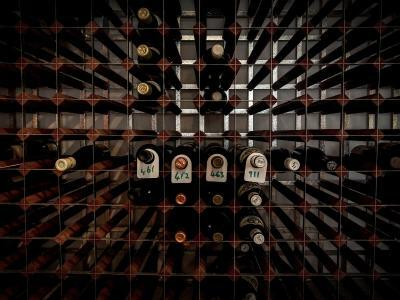 The contemporary Harbor Heights Lounge serves an impressive seasonal menu, and features bespoke furnishings and artwork. The lively bar offers classic cocktails and relaxing music. 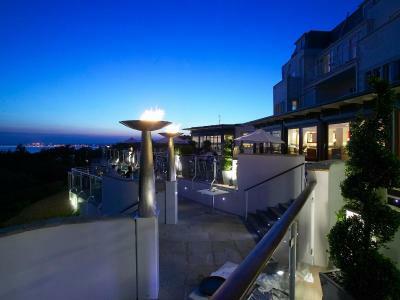 There is also a large, landscaped terrace with panoramic sea views for al fresco dining. The new Chinese restaurant ‘Ocean Palace at Harbor Heights’ offers an Asian dining experience while enjoying harbor views. 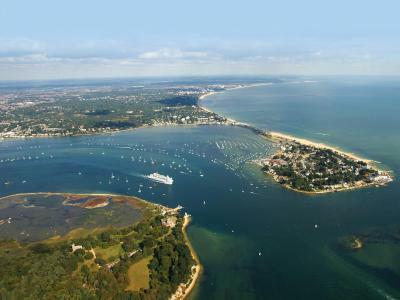 With views towards Brownsea Island, FJB Collection - Harbor Heights features a tranquil setting just outside Poole center. Bournemouth is a 10-minute drive and Parkstone Golf Club is just 5 minutes’ drive away. Sandbanks Marina is a 20-minute walk from the building. 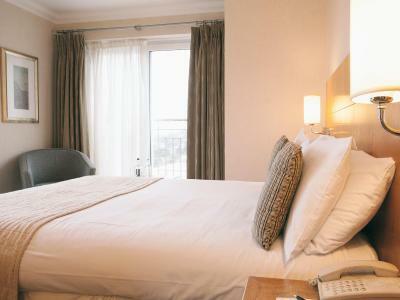 When would you like to stay at Harbour Heights Hotel? 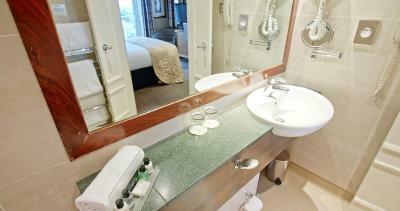 This nautically-themed room includes a bathroom with a relaxing spa tub and fluffy bathrobes upon request. Also includes a fridge, free Wi-Fi, satellite TV and tea and coffee facilities. With beautiful harbor views, this nautically-themed room includes a bathroom with a relaxing spa tub and fluffy bathrobes upon request. Also includes a fridge, free Wi-Fi, satellite TV and tea and coffee facilities. 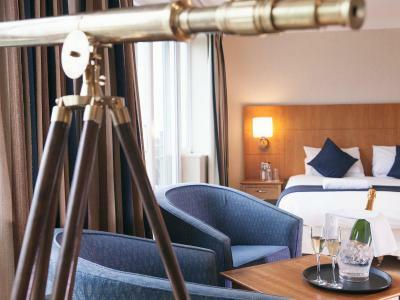 With beautiful balcony views of the harbor, this nautically-themed room includes a bathroom with a relaxing spa tub and fluffy bathrobes upon request. Also includes a fridge, free Wi-Fi, satellite TV and tea and coffee facilities. 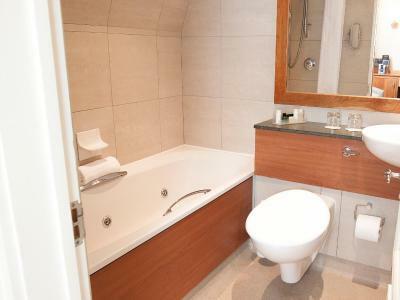 This double room features a electric kettle, bathrobe and spa bath. 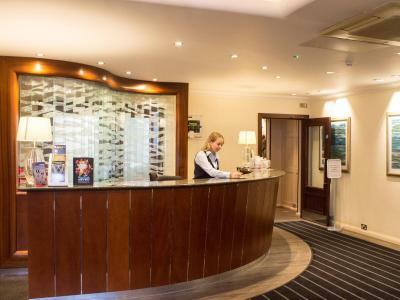 CRS team has an extensive knowledge of our hotels and different facilities associated with FJB collection such as Watersport, Spa and restaurants as well as recommending local attractions and information. 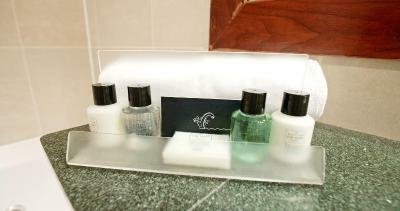 House Rules Harbour Heights Hotel takes special requests – add in the next step! All children from 0 to 3 year are charged GBP 5 per person per night in a crib. 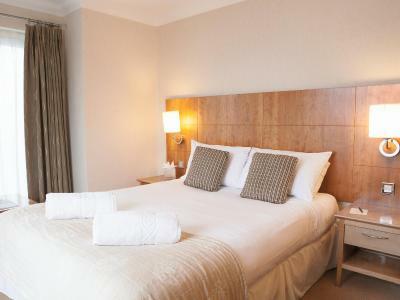 One additional child from 4 to 14 years is charged GBP 15 per person per night in an extra bed. Harbour Heights Hotel accepts these cards and reserves the right to temporarily hold an amount prior to arrival. Kindly note that this hotel can cater for guests with disabilities, please contact the hotel directly to ensure your requirements can be met. Advance booking is required to guarantee a table at the restaurant. Upgraded rooms with harbor views and balconies are available on request, subject to availability and an additional charge. Please request when booking. 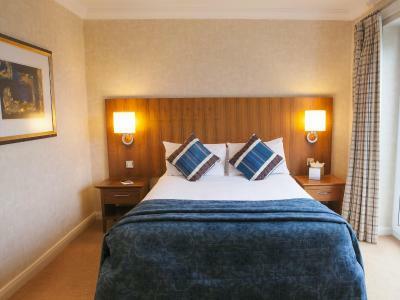 Please note that the hotel regularly hosts functions, so some noise may be experienced at weekends. Please note that the BBQ facilities are for group functions only, and guests are not permitted to bring their own food. 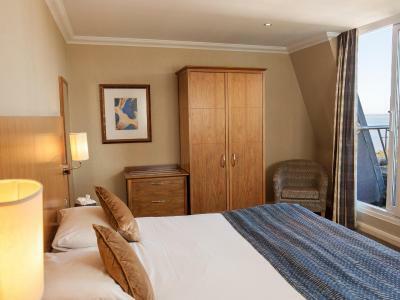 When booking more than 6 rooms, a GBP 50 nonrefundable charge per room is required. Having to pay £10 a day to park our car in the hotel car park. The main restaurant was closed for refurbishment...changing into a Chinese restaurant!! Our room was round the side of the hotel so we did not get a view of the harbour (very disappointing) One needs to book direct to ensure a good view and avoid the car parking charge. Room good for room 103 but small room 109 yet paid the same amount. The mattress on the bed was far too soft. My husband could not sleep all night, he called the bed ‘an instrument of torture’! The pillow were very hard as well and there were no blankets available as an alternative to the duvet. The decor in the hotel needs updating. Breakfast was the only problem. Guests were left to wander around the tables looking for an empty one and there was no help as to where everything in the buffet was located or what guests were expected to do. There should have been a member of Staff greeting guests to check their room numbers etc. and to take them to a prepared table and then explain how the buffet is operated. The room was full of lost souls needing help! 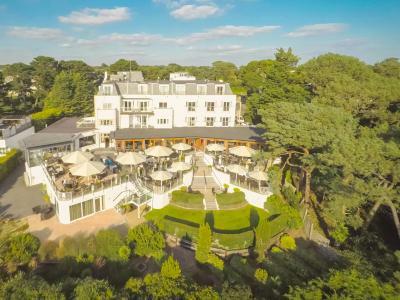 Lovely hotel in a great location with views. Room was really nice but the bathroom really let it down, so dated. All good except if I had booked direct I would have saved £10 per day for car parking!!! The hidden car parking charges£10 per night). Waived by the ridest hotel manager I have ever encountered. The breakfast offering was fine but self service. However many tables were not laid up or cleared. I arrived in the Saturday due to get married on the Sunday hoping for a relaxing night but the hotel held a party on the Saturday which played very loud bass music and lots of people on the terrace directly below my balcony shouting laughing drinking etc wasn't too pleased as room was very costly so expected a good night. A world class location and the staff were so welcoming. We arrived early but stll able to check into our room. 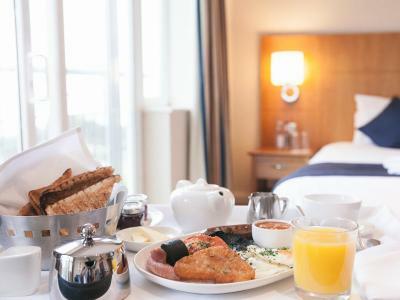 Breakfast was excellent and overall we could not have wished for a better stay. So looking forward to a return visit. Heating was being replaced and a Dyson fan heater was supplied. This was not adequate enough for the size of the room. Bathroom was very cold.